According to a new survey, the overwhelming majority of developers for Google's Android mobile OS see fragmentation as a concern for the platform. 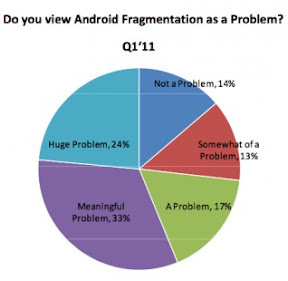 In a Q1 2011 survey of 250 developers conducted by analyst William Powers of Baird Research, 87 percent of Android developers responded with concerns over fragmentation, Fortune reports. Additionally, the percentage of developers who see device fragmentation as either a meaningful or huge problem increased over the last three months to 57 percent. Developers also see store fragmentation as an issue for the Android platform. "Generally, developers seem to prefer a unified, single store experience like Apple's App Store," Baird wrote. The survey found that 71 percent of respondents develop for Android, while 62 percent develop for Apple's iOS. According to the report, iOS outscored competing mobile operating system platforms when it came to developer's perceptions of ease of development, app visibility and the ability to get paid. Regarding app visibility, Baird noted, "iOS continues to lead, followed by Blackberry, with Android still receiving poor marks in this category." For its part, Google began implementing new restrictions on its Android partners last week in hopes of stemming fragmentation. In late March, the Mountain View, Calif., search giant closed the source code to its Android 3.0 Honeycomb platform, ostensibly because the release is not designed for smartphones. The first device to feature Honeycomb, which Google touts as having been designed "from the ground up" for tablets, is the Motorola Xoom. Apple Chief Executive Steve Jobs warned of the increasing risk of Android fragmentation last year during a quarterly earnings call. "Unlike Windows, where PCs have the same interface, Android is very fragmented. Many Android OEMs, including the two largest, HTC and Motorola, install proprietary user interfaces to differentiate themselves from the commodity Android experience. The user's left to figure it out," Jobs said. Jobs also warned of application store fragmentation, calling them "a mess for both users and developers." "Many Android apps work only on selected handsets, or selected Android versions," he noted.